By Scott Gilfoid: IBF/WBA light welterweight champion Lamont Peterson (30-1-1, 15 KO’s) has pushed back at the World Boxing Association’s decision to force him to give the beaten Amir Khan an immediate rematch in the next six months and written an appeal to the WBA to get that order overturned. This comes immediately after Golden Boy Promotions and Team Khan cancelled their appeal with the IBF the day before they were supposed to attend a hearing. Peterson and his management believe that Khan didn’t have a case and it would have been thrown out and that’s why they decided to cancel the appeal. Peterson isn’t going to be railroaded into giving Khan an immediate rematch by the WBA. If there’s going to be a rematch it will be one where Peterson and his voluntarily accept it rather than having it forced upon them by the World Boxing Association. Peterson’s trainer Barry Hunter feels that Khan couldn’t make the right adjustments he needed to make in the ring and then afterwards pointed the blame at others instead of himself for his inept performance. The way I see it, Khan and Golden Boy came up with far too many excuses after the fight to try explain away Khan’s defeat. We had them blaming it on the referee Joe Cooper, misplaced scorecards, errors in the scoring, mystery man sitting with the WBA supervisor Michael Welsh, Peterson coming in with his head and not being docked points, and Khan having two points taken away for pushing off. It just seemed like Khan and his team was using the shotgun approach to excuse making by throwing so many of them up with the hope that one or all of them in total would get the fight result overturned by the IBF and WBA. The WBA almost immediately gave in and ordered an immediate rematch, whereas the IBF wanted to have a meeting where people could interviewed. Unfortunately, Khan and Golden Boy decided to cancel the appeal on the eve of the meeting. That gave Peterson and his team the feeling that Khan’s team didn’t have a case and they got out to avoid losing. I hate to say it but I kind of agree with Team Peterson. I think the hearing would have gone down in flames for Khan with him and Golden Boy losing badly. 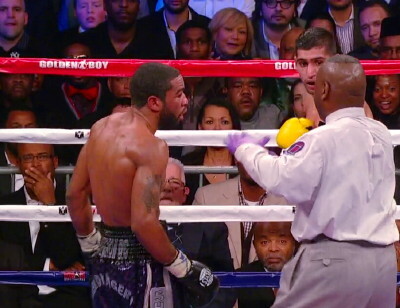 If you look at the video of the fight, Khan was fouling and getting beaten up in second of the fight. It didn’t look good for Khan. As such, coming up with an outside reason for his loss seems a useless gesture in what appears to be a person looking for an excuse to cover up a loss in the ring.